There’s nothing worse than opening a box of cereal only to find a bunch of little insects. 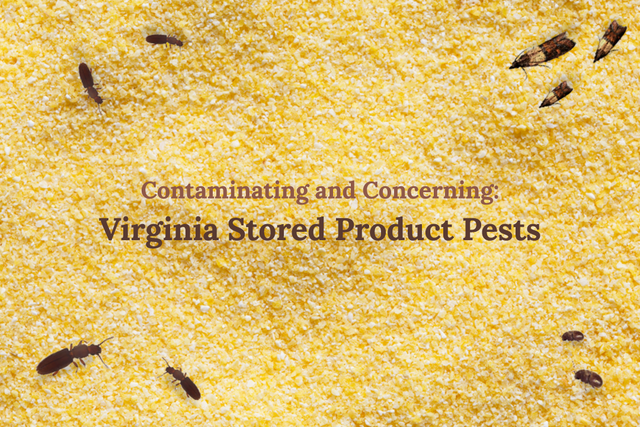 Stored product pests are an inconvenience for Virginia homeowners, ruining the food we keep in our pantries. But the problem is even more pervasive at the source: businesses. Insects from beetles to moths are capable of causing quite a bit of harm to establishments that process, manufacture, or sell food. Here’s why you should look out for them in your business. 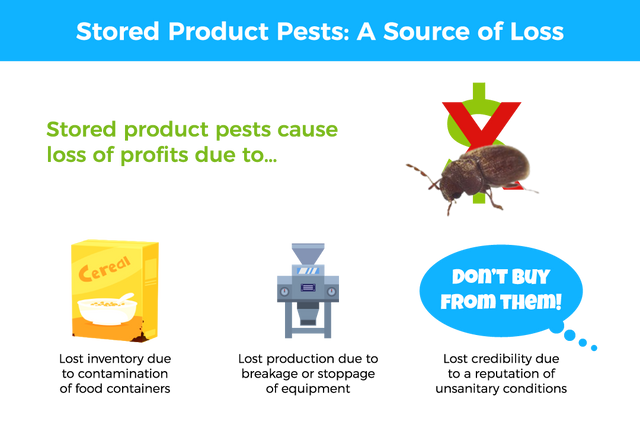 Beetles are a common stored product pest. Grain and flour beetles frequently target food storage areas. These insects are attracted to spices, nuts, meats, and cereals, and will chew their way through food packaging with their pincer-like mandibles. This often results in damaged goods that a company is not able to sell, even if the insects fail to reach the food item. Flying insects are another type of stored product pest, able to infest grains before farmers have a chance to harvest it. Along with these risks, stored product pest infestations usually result in revenue loss, fines, or closures and ingredient replacement costs. Most stored product insects are small critters, which makes it tough to spot them. They can hide in little cracks and crevices, and they can make their way into small tears and gaps in food packaging to reach food sources. This often results in significant damage. You must be active when it comes to combatting these insects. Be sure to check packages and incoming shipments thoroughly. When doing these inspections, look for signs of damage by searching for small holes that boring pests may have caused. To check for bugs in recently received packages, consider placing a small sample in an enclosed plastic container. Be sure to check the contained package later for signs of an infestation. Along with knowing that pests are present in your shipment, you will also be able to determine which types of insects are arriving. If your food product can take it, you can try using temperature to repel bugs. Most of these pests are unable to survive in extreme temperatures. Consider keeping your products in rooms that are 60 degrees Fahrenheit or lower. 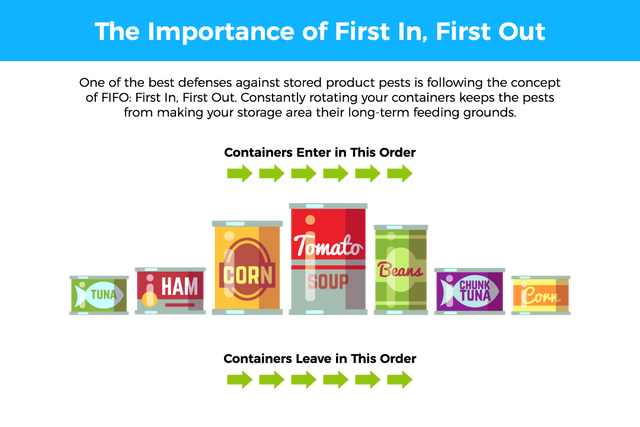 When storing food products, keep them off the floor and at least 18 inches from the walls. Taking this step makes it easier to keep the area clean, which means that it’s less tempting for pests. Deteriorating products are just asking for an insect infestation. To keep them away, make sure that your older food products are shipped out or used first. Also, get rid of any food items that show signs of damage. Establish a cleaning schedule and clean up spills right away. It’s important to also make sure that everything is wiped down and vacuumed regularly. Even if your prevention tactics go above and beyond the norm, your home or business could still experience a stored product insect infestation. To contain the risk, make sure that you or your staff take extra precautions when cleaning up an infested area and sanitize the space thoroughly. Make sure that your staff knows not to move infested products to other areas because doing so could cause the infestation to spread. Professional pest management companies like Connor’s Pest Control will treat these types of infestations by employing a combination of treatments. When area treatments are used, it typically involves fogging the space with pesticides that don’t leave behind a residue. This will let you get your business back in operation quickly. If you have a severe infestation, then your best option may be fumigation. Large facilities that experience infestations on occasion may need to be fumigated once or twice a year to prevent pests from moving in. Most businesses can prevent the need for this by keeping the facility cleaner. This is something that homeowners may want to keep in mind as well. If you’re in the food processing business in Virginia, pest control is a major priority. To prevent pests from infesting your home or business, the expert technicians at Connor’s Pest Control will work closely with you to determine if your business is at risk of infestation, and how best to take care of the problem. Developing a solid, year-round partnership with a pest control company like Connor’s is ultimately the most cost-effective solution to potential pest infestations. To schedule your free pest inspection, contact us today!